In my last post, I highlighted top picks from AMC’s new book Outdoors with Kids Boston. Today, I’m sharing the best locations in Outdoors with Kids New York City, as selected by the authors’ children. The de Jong-Lambert children—brother Riley, age 9, and sister Halina, age 6—are experts on outdoor adventures in and around Manhattan, where they live. 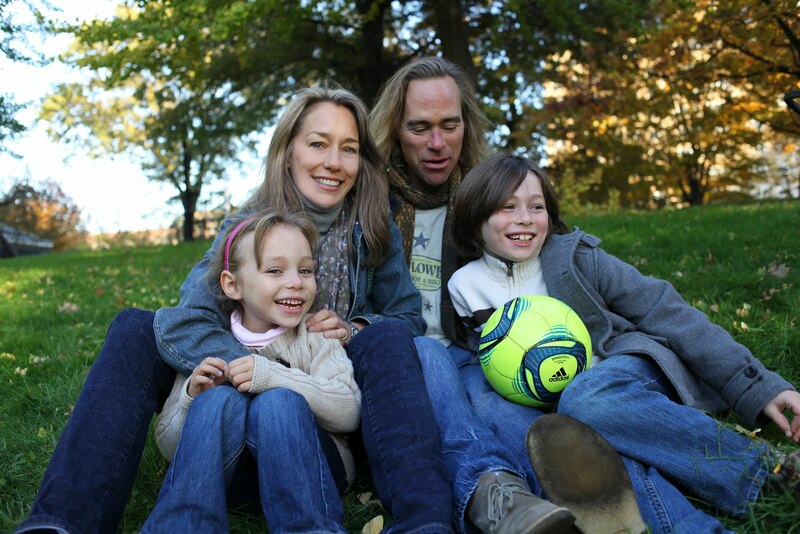 When their parents, Cheryl and William de Jong-Lambert, were doing research for the new book, Outdoors with Kids New York City: 100 Fun Places to Explore In and Around the City, Riley and Halina joined them on almost every trip. Whether kayaking from the boathouse at Pier 96 or finding their way through a Secret Garden maze at a Staten Island botanical garden, they spent months searching for the best experiences for other families to enjoy in the area. It’s no surprise, then, that Riley and Halina have strong and well-informed opinions about the places described in the book. What I found surprising, though, was that both children chose the same destination as their favorite: Bear Mountain State Park. It’s that good! So, with Bear Mountain at the top of the list, here are the seven best locations in the book, as judged by the authors’ kids. These locations aren’t limited to traditional hiking trails or paddling routes; the new book series includes all sorts of places where families can be active outdoors and connect with the natural world. 1. Riverbank State Park. The only state park in Manhattan, and open only since 1993, this park on top of an active sewage treatment facility by the Hudson River offers acres of “green roofs.” It also has playgrounds, ball courts, and a covered rink for roller-skating in warm weather and ice-skating during winter. But the Olympic-sized pool, where the de Jong-Lambert family swims during winter, is what made this one of Halina’s favorites. She also likes the view up to the George Washington Bridge, and the fact that this park is especially close to home—her family can walk or ride scooters to get there, without even getting on a subway. 2. Flushing Meadows Corona Park. Site of the 1939 and 1964 World’s Fairs, this park sports a gigantic metal globe called the Unisphere, which Halina pointed to as one of the signature attractions. “I like that it's the welcoming of the universe,” she told her mother. “It is also fun to try to find the different continents and oceans around the world.” The park also offers bike paths, a boathouse with rentals, and a playground designed for children with and without disabilities. 3. Jones Beach State Park. “I like that it has a boardwalk that you can walk on, and I like that because it has information about birds and other animals,” Halina said of this park, which is home of the Theodore Roosevelt Nature Center. “I also liked the ocean beach,” she added, referring to the 6.5 miles of beach along the Atlantic. 1. Fire Island. “Fire Island has a nice beach,” Riley said. “I like that you can go very far out and it is still shallow [on the bay side]. And on the Atlantic Ocean side you can enjoy big waves.” Only service and emergency vehicles are allowed on this island, so visitors get around on foot or on bicycle. AMC members and their guests may stay at the Fire Island Cabin, which has sailboats, kayaks, and canoes. 3. Floyd Bennett Field. New York City’s first municipal airport, this location in Brooklyn is now home to the only public campground in the city and hosts a family camping program run by National Park rangers. “Amelia Earhart took off from there,” Riley said, when asked why he likes it. “It is interesting because she flew to the Pacific Ocean and disappeared. I also like the old buildings because I hadn't seen them before.” The abandoned airplane hangars from the age of early commercial flight are now listed on the National Register of Historic Places. 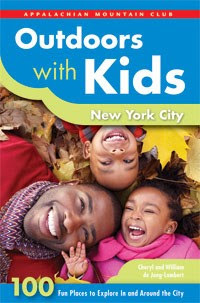 - Check out Outdoors with Kids New York City at AMC’s store. - Meet authors Cheryl and William de Jong-Lambert on Mother’s Day, Sunday, May 13, from 1 to 2:30 p.m. at Prospect Park’s Audubon Center. The fun family event will include a scavenger hunt, a campsite to explore, and a guided nature walk. - Learn about AMC’s Kids Outdoors online communities for New York City and Boston, set to launch in May. These sites will offer more tips and activities for families interested in getting outdoors.